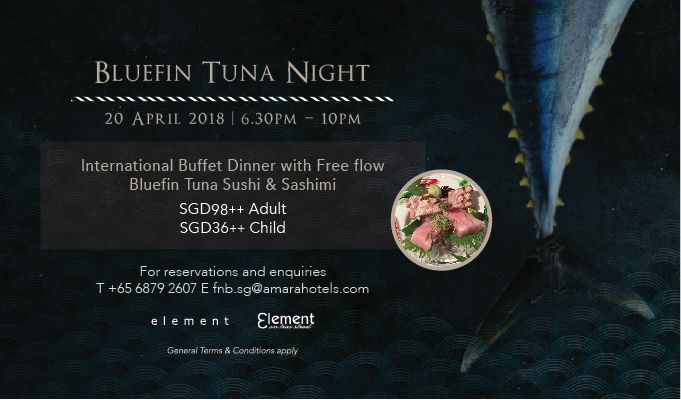 The highly prized fish will be unveiled at Amara Singapore. Watch chef showcases his expertise as he cuts an Okinawa air-flown 50kg Bluefin tuna. Indulge in endless servings of the freshest fish and other sumptuous dishes in the buffet. - Not valid with other promotions, privileges, discount cards and promotional vouchers, whichever is applicable. - All prices quoted are in Singapore dollars and subject to service charge and prevailing government taxes. - Amara Singapore reserves the right to change the Terms & Conditions without prior notice.